The growing tide of support behind the legalization of cannabis – whether for medical or recreational use – is already transforming the face of the capital markets in North America. Where the drug was once bought and sold on street corners, lawmakers are now waking up to the potential benefits of marijuana – and the lucrative market the plant is steadily creating. Once the preserve of small ‘mom-and-pop’ operations, cannabis is rapidly becoming a multi-billion dollar industry, with both its own players – the likes of Canopy Growth Corp, Tilray and Aurora Cannabis – and a growing trend of large consolidating brands moving into the space. In fact, the industry could be worth $100 bn within 10 years, according to recent estimations. 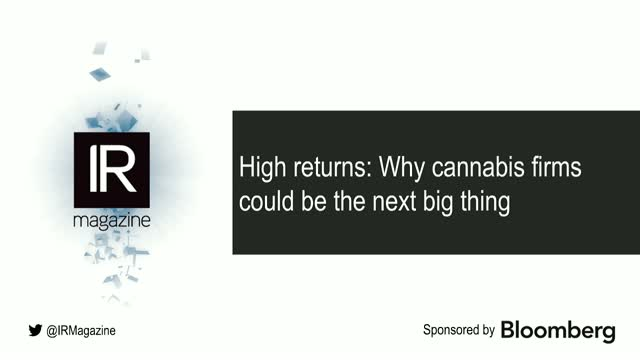 In this IR Magazine Webinar, held in association with Bloomberg, expert panelists will dive into the trends that define the cannabis industry, the wave of state approvals that could lead the way to federal legalization, and the implications the blooming industry has for the future role of IR. Investor interest in ESG issues continues to grow. Evidence is mounting that environmental and social issues can be financially material to business performance. Companies are responding to these market signals, with more than 85 percent of S&P 500 companies now reporting on their ESG and sustainability performance in some form. Although climate risk and diversity continue to be top issues of interest to investors, there are hundreds of ESG metrics that companies are being scored on. While ESG roadshows may be the norm in Europe, they are just starting to gain traction with US companies. How should investor relations officers (IROs) prepare for this new wave of investor appetite? •Why do IROs need to create a compelling narrative on ESG performance that is aligned with the business strategy, and what should that narrative include? •Why should IROs prioritize and focus on the most material ESG issues to the business, and how do you determine what those are? •What are some best practice examples of strategies and tactics that leading companies are using to build capacity within IR and corporate governance departments to communicate with investors on ESG issues? The rise of passive investing has been one of the defining themes of asset management over the past decade. While this significant shift from active to passive investment has sparked wide-ranging research and commentary about its effects on the wider economy, it is time to assess how IR teams globally can have any impact on the decision-making process of a passive investor. We will explore how these index-based investors make decisions, how they perceive a company’s equity story and how an IR team can stand out in an increasingly data-driven world. We will explore the need for greater disclosure around corporate governance policy, board structure and sustainability policy in order to be included in indexes. • Resource check: Evaluating return on time invested in proactively targeting passive investors. How does this change how you work with active fund managers? • Stock up your toolkit: What skill-set should you be looking to add to your team to get proactive with passive? How your business operates within a broad societal context is core to the longevity of your business. Larry Fink’s 2019 letter to CEOs highlights that profits and purpose are inextricably linked. When looking at ESG issues, social impacts are often lumped in with environmental and governance issues – but investors are increasingly seeking deeper information about a company’s social impacts as a stand-alone consideration. A new generation of retail investors is increasingly concerned about topics like executive remuneration, board diversity or social and human rights issues throughout a company’s supply chain. New index products have appeared that screen for firms with good practices. Furthermore, the pool of institutional investors that integrate ESG factors into their investment and voting decisions is rapidly growing, as is the expectation for companies to incorporate a social narrative into their equity story, and disclose information on social factors – something that is notoriously hard to quantify. Much has been made in recent months of the way Mifid II is likely to place barriers in the way of successfully setting up non-deal roadshows (NDRs), or roadshow meetings, with investors. The expectation is that roadshows will not only involve more figurative legwork to get up and running but also more physical legwork – involving longer periods of travel time as sell-side assistance with scheduling meetings becomes rarer. In this webinar, speakers are invited to discuss in detail how to use what IROs already know and combine it with the new tools and services filling the space left by the sell side to ensure a sufficient number of meaningful interactions still take place. Speakers will explain best practices for drafting target client lists and outsourcing to the best alternative brokerages in the market. The aim of the discussion will ultimately be to unpack how IROs can embrace and own their newly center-stage role in the current environment without becoming overwhelmed and overburdened. As the end of 2018 approaches, GRC teams are already turning their attention to the challenges and opportunities they and their companies face in the year ahead. Join Corporate Secretary and Nasdaq to gain insight and advice on some of the key areas you and your colleagues should be considering as you prepare for 2019. Short, sharp and packed with expert insight, this webinar will get you up to speed on these critical issues in just 30 minutes. Sign up to BrightTALK to view this essential briefing and be informed of future webinars produced by Corporate Secretary. Are exchange-traded funds (ETFs) a danger to the stock market? Or a natural progression driven by the needs and wants of institutional investors and their clients? One thing is certainly true: inflows into ETFs, index funds and similar products are increasing month on month. In April 2018 alone, passive US equity funds took $18.2 bn of inflows, while active funds suffered $11.4 bn in outflows. In a bid to understand this investment discipline, this IR Magazine Webinar, held in association with Blooomberg, will aim to find answers to these questions and more with the aid of our panel of expert speakers. Short, sharp and packed with expert insight, this webinar will get you up to speed on these critical issues in just 30 minutes. Sign up to view this essential briefing and be informed of future webinars produced by IR Magazine. Investors are demanding that proxy statements include a greater range of information. In turn, companies need to disclose that information – and tell their story – in the most effective way. One solution is to create a ‘next-generation proxy summary’ that includes an extended summary spelling out the key information investors need. This can be used as part of the proxy statement and as a stand-alone document. - What information should the extended summary include? What do investors want, and how should governance teams research what this is? - What are some of the new best ways to present that information? - How can governance and investor relations (IR) teams work best together and with other functions (the board, HR, IT, management and outside vendors) in preparing the extended summary? - How can governance and IR teams use the summary during the approach to the AGM and outside of proxy season? How can it best be delivered as a stand-alone document? - What is the best way to get feedback on your summary from investors to improve it for the following year? Join Corporate Secretary and Nasdaq for a discussion on cyber-security. This webinar will explore how it is vitally important to keep a consistent and unified narrative across and throughout the organization when a crisis hits on social media. What went wrong for these to happen? How could these have been dealt with more effectively from an IRO perspective? Is there a limit to how the IRO can control the company narrative once these comments have been made? Why IROs should monitor social media posts about their companies. How can this be done effectively? How can the IRO put social media at the heart of the overall IRO strategy? The instant reply: ensuring a comment is addressed immediately, in real time. What is suitable for the IRO to convey on social media? Even in a crisis. Investor targeting is one of the most crucial pillars of a strong IR program, and a comprehensive approach can boost your company’s liquidity, visibility and more. Indeed, more than a quarter (26 percent) of the nominees for the recent IR Magazine Awards – Europe 2018 say that if they had more cash, they would spend it on investor targeting. Almost a third (32 percent) say this is where they would dedicate the extra resources if they had a larger team. Short, sharp and packed with expert insight, this webinar will get you up to speed on these critical issues in just 30 minutes. Sign up to BrightTALK to view this essential briefing and be informed of future webinars produced by IR Magazine. The debate around ESG is one of the most compelling in the IR world at the moment: are governance teams at large institutional investors dictating a narrative that is unrepresentative of the broader investment community or are investors genuinely broadening their assessment of what they deem to be material for their investment process? What is clear is that ESG is much more of a talking point on earnings calls and in other forums between investors and issuers, according to data from Intelligize. In this webinar we will explore how IR teams and corporate secretaries are working together to ensure that their company is well prepared for investor questions on ESG – whether they come from portfolio managers or governance teams. Short, sharp and packed with expert insight, this webinar will get you up to speed on these critical issues in just 30 minutes. Sign up to BrightTALK to view this essential briefing and be informed of future webinars produced by IR Magazine and Corporate Secretary. Holders of the NIRI IRC® credential can earn 1 professional development unit (PDU) per webinar. IRC-credentialed speakers may also earn PDUs. More information is available at www.niri.org/certification. As Mifid II exacerbates the pressure on small and micro-cap firms to be noticed by investors and analysts, join us on this timely Q&A session with the investment community on what makes for effective IR and how this shifting landscape makes it important for IROs to be prepared to meet these changes. • What makes for effective IR at a time like this? Where can IR add value? • Role of research in a post-Mifid II world – how can smaller firms ensure coverage? • How does IR balance what the buy side wants with what the sell side wants? • Making small companies attractive to institutions: Targeting tips – which events work best? The discussion will be followed by a short awards ceremony to recognize those leading the way in IR excellence at small-cap companies. The last year has seen considerable attention focused on the growing demands from institutional investors for companies to make new ESG-based disclosures. Amid the focus on environmental and governance issues, there has been less discussion of social issues. But more investors are looking for disclosure in this area, and one of the key challenges for companies and their IR teams is deciding on and delivering the right data. In this webinar, a panel of industry specialists will examine what investors want to know, and how IR practitioners can ensure their company is telling the right story in the most effective way. • How well are companies delivering the information investors seek – and what can they do to improve their performance? • Faced with a range of indices and requests for different types of data, how can IR teams decide where to focus their efforts? • How can you turn the qualitative nature of many social issues into numbers? • How can IR teams best leverage their ‘E’ and ‘G’ efforts in the ‘S’ space? Artificial intelligence (AI) is quickly moving from the realm of science fiction to that of science fact. IR teams need to understand how best they can harness its potential – such as in surveillance and activism contexts – which tools are available to them and how best to use them to help with workflow and accuracy of data. • What are the potential future uses of AI and what tools would IROs like to see? Many US companies are grappling with FASB’s changes to reporting revenue. These changes have a knock-on effect for the analysts who cover you as internal models need to be updated and revenue needs to be recalculated. At Microsoft, the IR and accounting teams recognized the risks of the revenue recognition changes early. By starting early, they were able to address investor and analyst concerns, provide dedicated resources around revenue recognition, and clearly inform their investors and analysts of what the changes meant for them. The teams were recently presented with the Pacesetters of the Year award for excellence in financial reporting. Join this webinar for practical tips on navigating this accounting change and how you, as IR professionals, can keep your investors updated. Building a trusted rapport with their CEO and CFO is crucial for IROs, who act as advisers on company messaging and capital markets, and whose credibility with investors and analysts is based on being in the loop. Depending on their company’s culture and their C-suite’s level of buy-in for IR, some IROs may need to make a case for senior management to dedicate time to roadshows, investor conferences or interaction during site visits. They should also strive to make productive use of a CEO’s or CFO’s time spent on IR. From a careers perspective, IR is increasingly considered a must-have experience for finance professionals wanting to step up to the CFO role. The IR professional’s role has evolved into a significant function at large companies – especially those with an international shareholder base. From corporate sustainability and SEC disclosure effectiveness to revenue recognition and reputation management, today’s IR professionals are instrumental in value creation and are more vital to public companies than ever. With the end of each fiscal quarter comes preparation for the ubiquitous earnings announcement, where IROs must be fully versed on the issues of the day and how they impact shareholder value. Given the vast spectrum of information they manage and the litany of regulatory and compliance standards they must consider on a day-to-day basis, IR professionals are fast-becoming a critical component of corporate management. As an IR professional, you spend your day preparing for investor calls, monitoring company mentions and responding to questions. If you’re not yet running competitive intelligence as part of your IR practice, you are likely missing valuable information on your industry that can greatly affect your company’s success. In order to effectively manage these responsibilities and provide necessary information to the C-suite, IROs need to be the equivalent of a superhero. In just 30 minutes, you’ll learn how to use technology to instantly find valuable insights and reduce your research and preparation time by hours – even days – so you can focus on showcasing the value your IR program adds to your organization. With 500 mn tweets being added to the daily flow of news, it can be a challenge to isolate the media content that will impact investors’ views of your company. IR Magazine is a publication of IR Media Group, a business media company renowned for its magazines, websites, events and research. This webinar series is part of our commitment to providing ongoing education to the IR community. Working with various experts in their field, join the thought-leadership discussions on key issues affecting investor relations, guides to best practice and much, much more.